Martin Truex Jr. laps the Charlotte Motor Speedway Roval during Goodyear tire testing on Wednesday. 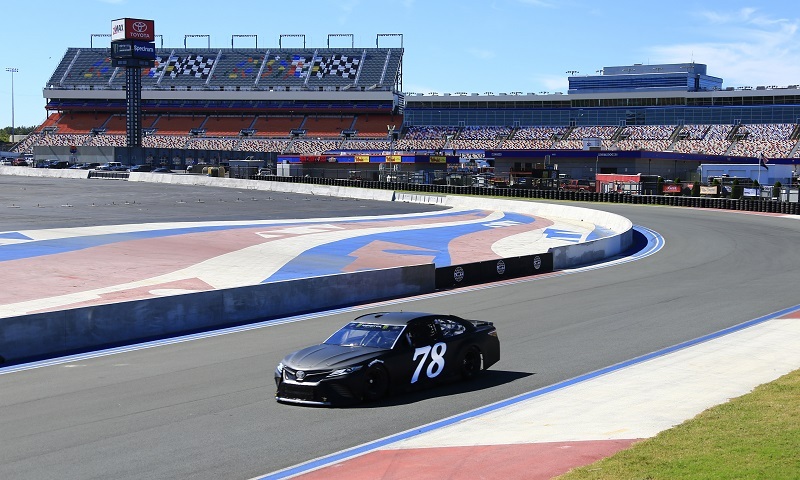 CONCORD, N.C. – Two days of Goodyear tire testing on the Charlotte Motor Speedway Roval concluded on Wednesday, with drivers gearing up for next year’s Bank of America 500 by lapping Charlotte’s challenging, 18-turn, 2.4-mile course. Martin Truex Jr., Kurt Busch, Jamie McMurray and Daniel Hemric tested tires for next year’s Bank of America 500 which is set for Sept. 28-30, 2018 and will be the first road course race in the 14-year history of the Monster Energy NASCAR Cup Series playoffs. Drivers reached top speeds of 175 miles per hour around the Roval, which features a 35-foot elevation change, as well as more turns than any track on the NASCAR circuit.